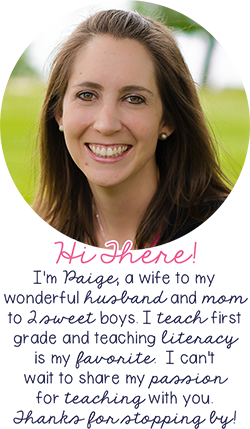 If you've been following my blog this summer, you know I've got a new mission: to support parents and families in reading to their children. We know that reading aloud to our kids is so important. I'm back to tell you 6 more (REALLY) important reasons why you should read to your children. If you missed my first post, 4 important reasons why you should read to your children, you can check it out >>HERE<< or by clicking the image below. 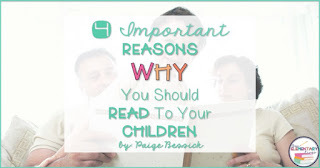 I'm back today to tell you 6 more really important reasons why we need to read to our children. The first four are very important, but these reasons are all academic based. When we read aloud to our children, they can learn so much and it prepares them for school success. If you haven't checked out these books, you definitely should! Click the images below to see on Amazon. 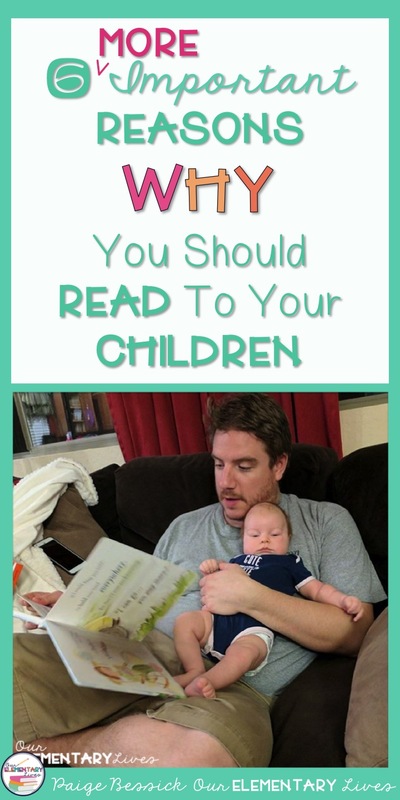 If you need reasons to read to your children, this is it! These are vital in their academic success, I cannot stress that enough. When you start reading to a child, it's going to be tough. When you have a 2-3-month-old or even 8-month old like I have, it's not easy. They don't sit there and listen. They want to squirm and move and eat the book. But the more you read to them, the better they will become at being able to concentrate and focus on books. Benjamin, my 8-month old, has a hard time sitting and listening to books. He just started to crawl and that's all he wants to do, but I stick with it because I know at some point, he will be able to sit and listen to a whole story because I stuck with it. 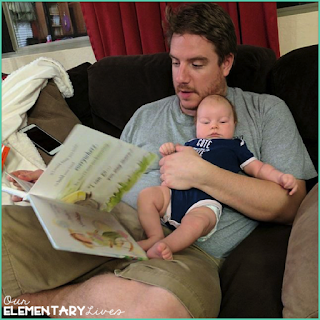 My friend, Todd, reads to his newborn Leora. Children who are read to early and often will quickly learn the skills needed to concentrate and focus on an entire book. They learn fast that books are enjoyed and that there is a great story waiting for them when they open a book. If children don't learn early how to listen to a story, it will be hard for them to ever be able to settle down for a book. In my class, I can tell you who are read to and who is not just by doing read alouds. Those kids who are not read to cannot sit and just listen to a story. How do we build that ability to concentrate, focus and listen to a story in its entirety? Read to them! When you choose beautifully written or not well-written, well-known, or not so well-known texts, something always happens no matter what book you read. It is inevitable that your child will ask questions. By asking questions, you are provided an easy opportunity to talk about important topics. When you read books like Smash! Crash! by John Scieszka you have to talk about what good friends do because Jack and Dan are not always the nicest trucks. And your son wants to know why they are being so mean and not making good choices, so you have to talk about it. Or when you read My Father's Dragon by Ruth Stiles Gannett and your son wants to know what kind of person would ever tie up a dragon. And even though it's a fantasy where animals talk, you have to discuss why someone would ever want to tie up a baby dragon, or any animal for that matter. These are the conversations that teach your children about life. How to act, what's appropriate or not appropriate, how to be kind, how to be a good friend, what heaven is...you name it, it will probably come up. You are sharing important life lessons with your children. Life lessons that they might otherwise not learn. So how do you teach them these life lessons? Read to them! How many questions is my child going to ask while we read this book before bed? That's always the question and as much as I try to hurry things along (I've got stuff to do), those questions and talking skills are so important. 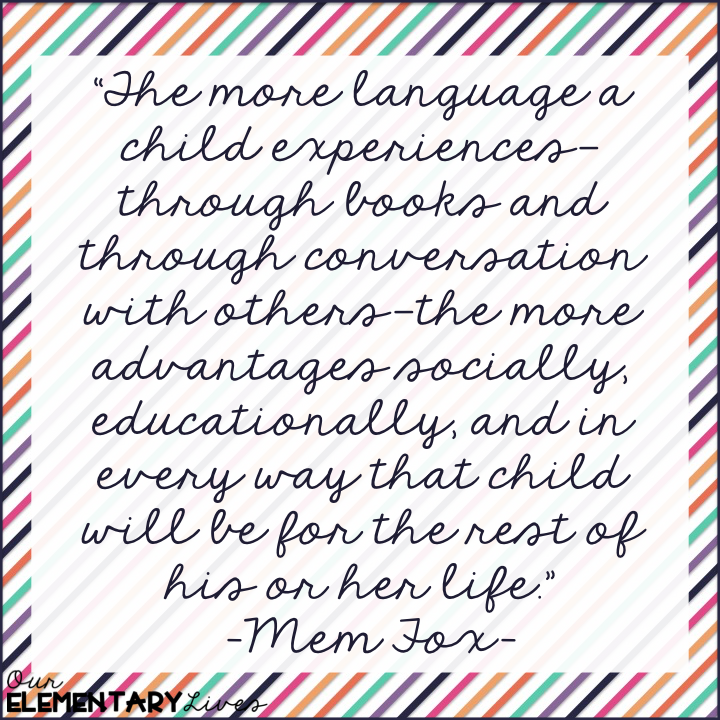 "Children don't learn to talk unless they are spoken to... which is why we need to have loving, laughing, deep-and-meaningful conversations with our kids" (Fox, pg. 15). Read aloud time is the perfect time to engage in these conversations that teach them so much about how to speak and have conversations. In first grade, we work so hard on having back and forth conversations. I can tell right from the beginning of the year, who have had those experiences at home. By reading books, you are providing ample and easy opportunities to practice these skills. What's the best way to build speech and conversation skills? Read to them! Think about where you "go" when you read a book. Construction sites, the jungle, far away places, fantasy islands. When you share a book with your child about lions, you are building their background knowledge and vocabulary about lions. They will learn that lions live in jungles, that males have manes, what their prey is, etc. When you read books, everything you read is going into their little brains and you will be surprised at what they will know and remember. Every time you read, your child will be introduced to new words and new ways to use familiar words. This has a profound effect on their learning. I won't go into too many details, but in Jim Trelease's book, he talks about the amount of words heard by children by the age of 4. Kids from professional backgrounds hear about 45 million words by age 4. Kids from poverty only hear about 13 million words by the age of 4. This then leads to educational success. He says, "the least expensive thing we can give a child outside of a hug turns out to be the most valuable: words" (pg. 16). Jim also states that "The one pre-kindergarten skill that matters above all others, because it is the prime predictor of school success or failure, is the child's vocabulary up entering school" (pg. 15). Don't we want to support our children's school success? Read to them! Comprehension is the ability to understand and recall a story. As we read, we are comprehending and understanding what is happening in the story. By being read to, your child is building their listening comprehension. Children are able to understand higher level books than what they can read. Think about the books you read to your kids. They can't read them, but they for sure know what's going on. Listening comprehension is so important because it is one of the determining factors in your child's ability to comprehend as they read themselves. When they are read to, they know that they have to pay attention to what's going on in the story to be able to understand what is happening. This skill is vital because when they go to read on their own, they will know that they have to pay attention to what is going on in the story, not just what the words are. 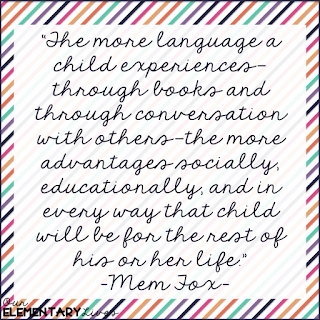 Build their listening comprehension so they will understand what they read on their own when the time comes. Read to them! Okay, okay, so they may not learn how to read words or all of the sounds or how to blend or segment words, but they learn the essential skills that are the basis of learning to read. They know how to hold a book and turn the pages. They know that books with words tell stories and that pictures support the stories. They can tell you what a sentence, word, and letter are. They can tell you that books have characters, a setting, a problem, and a solution. Probably not with those terms, but they understand how a story works. They can tell you what a title is, what an author and illustrator do and most importantly, they can tell you that they LOVE to read. Having a love for reading is the hardest part of learning to read. As a first grade teacher, I come across this all the time. We read books daily in my classroom and I try my hardest to impress upon my students, and my own boys, my love of reading. But unless they have that love themselves and get it from their own parents, they may never understand the importance and power we have being able to read. Want your children to learn these essential skills? Read to them! 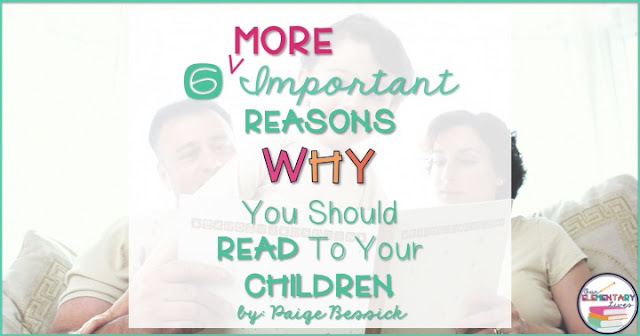 So there you have it, 6 really important reasons why we should read aloud to our children every day! I'd love to know any questions or comments you have and I love to connect with my readers. You can email me at ourelementarylives@gmail.com, I'd love to hear from you. If you know someone who you think would like this, please share and make sure to pin. Until next time, read to your children!